Why does a section of ultra-high pressure tubing rated at 90,000 psi or even 150,000 psi fail when the highest pressure it ever experiences may be much lower? Is there something wrong with the material? Is there something wrong with the design? Is there something wrong with the rating system? The answer is none of the above. The problem is metal fatigue. Fatigue is a term used to describe the failure mechanism of metals that are subjected to cyclical stress. Cyclical stresses cause very small cracks to form and then grow until the resulting large crack weakens the structure so much that a sudden failure occurs. It is as if the metal became fatigued and gave up. You can witness such a failure in just a few cycles by bending a paper clip back and forth until it breaks. Every time a pressure-loaded component in a waterjet system is pressurized and then un-pressured it goes through a stress cycle. If a high pressure component is subjected to its full rated pressure and allowed to remain at that pressure, its life will be virtually infinite. However, if its pressure is cycled on and off over and over again, it will most certainly fail. The number of cycles required for failure is determined by how close the cyclical stress is to the ultimate strength of the material. The S-N diagram (Stress vs Number of cycles before failure) shown below illustrates this for a typical steel. When the stress level for each cycle is close to the rated maximum stress of the material, the component may fail after just a few thousand cycles. However, as the cyclical stress is reduced, the average number of allowable stress cycles before failure increases dramatically. 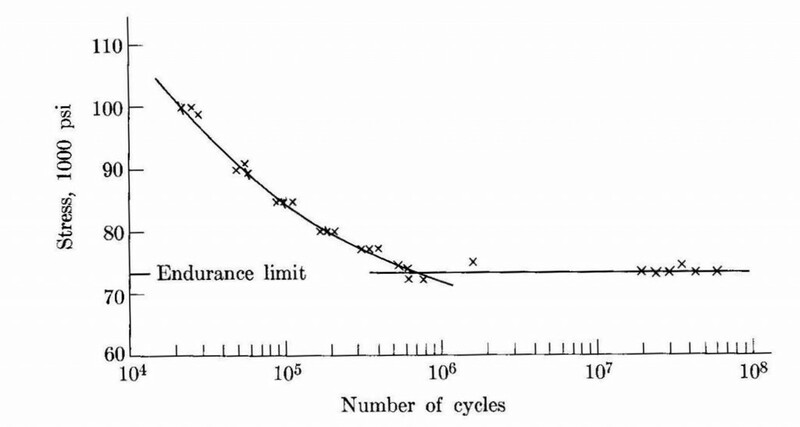 Indeed if the cyclical stress level is reduced to a level below what is known as the Endurance Limit, the allowable stress cycles before failure in steels become virtually infinite and the fatigue problem goes away. What can we do to minimize the problem of fatigue? One trick used by manufacturers of ultra-high pressure components is a manufacturing process known as autofrettage. This technique was originally developed to strengthen large gun barrels on battleships (an application in which each shot fired represents a stress cycle and where a fatigue failure can be particularly catastrophic!). Under this technique residual compressive stresses are intentionally created in the inside surface of a hollow cylinder (such as a pump barrel or a length of ultra-high pressure tubing). These residual stresses have the effect of reducing the effective net cyclical loading and thus increasing the number of allowable stress cycles before failure. Unfortunately this technique also increases the cost of these components. In addition, it is not really practical for the complex shapes found in such components as fittings, valves, nozzle bodies, etc. By far the most effective way to reduce fatigue stress and increase component life is to simply operate the system at lower pressure. As one can see on the S-N curve, a 30% reduction in cyclical stress can increase the allowable number of stress cycles by a factor of 8 or more. The primary reason that fatigue has become such an issue in ultra-high pressure waterjet systems is that users want to increase their productivity and are doing this by raising the operating pressures to increase the power at the cutting nozzle. However, as I have discussed in previous entries to this blog, power at the nozzle can also be increased by simply increasing the flow rate. With greater flow rate, as opposed to greater pressure, higher cutting power can still be realized without the drawback of decreased component fatigue life. This results in lower maintenance costs and greater system reliability, which in turn means more cost-effective operation and less unexpected downtime. Indeed, unexpected downtime is the worst part of fatigue. That nice smooth S-N diagram is statistically correct and can accurately predict the average cycles to failure for a large sample of components. However, for an individual component the average doesn’t have much meaning. The slightest scratch or imperfection in a component can speed the initiation of cracks and reduce the fatigue life below the average. You can be sure the component will fail from fatigue, but you never really know quite when. That can really mess up your production schedule.